@candycottonchu No problem! Hoping to see them? and I have moved a special project onto my table (finally) so YAY! Just trying to finish up a bear of a project that I thought would be easier, but I think I got too emotionally invested. So now I'm being all nit picky and gummin' up the works. I'll get through it though - I wish I had 10 mins for every minute I have! @kirivian sure, I'll post them in my thread when I'm done c: I got them poses into my game, but it might take a while, as for now I haven't done anything related to my story since the last update, lol, for personal reasons that don't belong here, except some lookbooks on my tumblr. Ehhhhh and I'm curious to see your next projects! Time lack is a serious issue! Hi Y’all. Sorry it took me so long to put this post together, but there’s been so much going on with my game and IRL that I have been having trouble finding the time. (either that or I’ve been procrastinating – you know, one or the other. ). I have not patched the game because I am concerned about the CAS aging patch as well as the Father winter children disappearing bug. These are IMO really devastating, game-breaking bugs, but I am led to understand that the dev team is working on it. So…. YAY!! Hey all! Okay, long time coming but I do believe I am overdue in properly introducing the vampire Amriel Croft. Amriel has been a bit misrepresented here on the thread as I opted to use him as a sort of Catboy Mascot for various messages and so forth, but in my game, he is a real vampire, not just a plasma sucker with cute ears and a tail. So, some quick facts about Amriel. 1)	He is a genetic brother to Kira and was created for Frostridge. 2)	He was put in the game as a teen vampire (his back story is that he was born a vampire although his brother wasn’t). They were added to the game as orphans. 3)	He was raised and trained by Talos, Caleb and Lilith and remains very close to them. 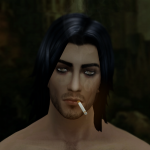 4)	He has recently become the fourth of my Frostridge sims to also join my Star-Crossed cast. 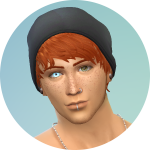 5)	In Frostridge he is polyamorous and lives with his two lovers Aris and Caiden in San Myshuno. 6)	In Star-Crossed he is monogamous and recently got engaged to another add from this thread, from the Frost Clan of vampire hunters originally created by @paradiseplanet, Jacques Frost. 7)	He is a Grand Master vampire and has most of the powers as well as a bunch of spare points for more if he wants or needs them. His weaknesses are Guilty Drinker, Nightmarish Sleep (2) and Day Phobia (2). 8)	His prime traits are Creative, Genius and Geek. His profession is eSport Gamer. 9)	He is an avid Cosplayer and has regular costumes for both his regular form (Cos-cat) and his Dark From (Dark-Demon). This is a mish mash of CAS shots from both Frostridge and Star-Crossed because a lot of his wardrobe overlaps. the patch seems good so far I mean make a backup but I saw all my frost kids were right and I could go in and out of cas without worrying. @kirivian Look at my kyute pretty boi go! Luv the way you've done for him! You've outdone yourself this time! Hey guys! Thanks! You know how spoiled I get to feeling when my projects are liked. @afai1261 @RedDestiny92 Thanks for the head up on the patch. I've been waiting and watching all along - then finally as I got to finishing this update, it just went right out of my head and I didn't even realize there was a hotpatch. LOL. There's my dumb shining through. Now I need a day or two to update and patch my game!! @paradiseplanet Thanks. He means a lot to me for a number of reasons AYK! Then we'll have to spoil you more when you post more hehe, ah you're not dumb I wasn't even expecting it before I saw that someone posted the tweet that it was coming I was just glad to see it working. Hey All! So this collaboration is all about two folks who have been great friends and supporters of mine here on the forums, @candycottonchu and @afai1261! For the first time, but not the last, I am featuring a collection of poses here that were created by our very own @candycottonchu. Consequently you will probably note that each section features the same pictures taken from different angles and such, but the beautiful job that was done with these poses tell a story all their own and each picture was IMO post worthy. 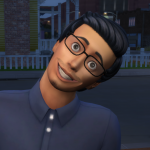 I am also working with some characters from @candycottonchu's simlit, Neighborhood Talk, and hopefully I will have something to share with you from that project soon, but in the interim this posepack, "Long Time No See", as well as a number of other posepacks and "goodies" can be downloaded from the Neighborhood Talk trash page! 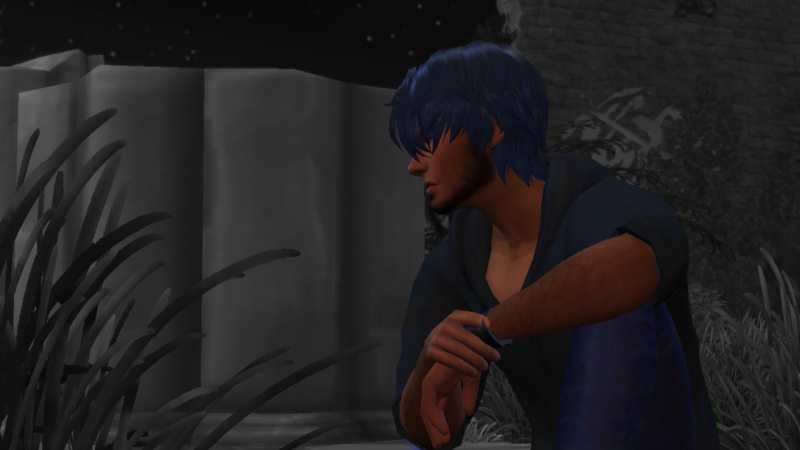 In addition to the poses, the male character featured in these pictures is none other than townie Morgan Fyres. After being transgendered and made over by @afai1261, I took him into CAS and did my own makeover on him. So this is kind of a collaboration between the three of us - me (the female character is mine), @candycottonchu (who did all of the poses) and @afai1261 (who did the base character for the male character). I hope y'all like these as much as I liked making them and presenting them! Thank you so much to both of you multi-talented and awesome folk. It's an honor and a treat to work...play with y'all and I am as always thrilled to get to be part of your worlds! This is very picture intensive, and to exacerbate the situation I left these shots pretty much raw except to crop them to remove the noise from the rest of the original image. So these are not resized, just the clutter cropped out. (The male pose for this combo was different for the all-in-one shot (featured here) and the individual shot (not featured in this shoot) - anyone interested in the alternate pose can see it modeled by my sims Sean and Jun as well as @candycottonchu's characters on the download page for the posepack. @kirivian I love those poses ha they make them look like such a cute couple. @RedDestiny92 I know, right? @candycottonchu did a really beautiful job here and it's not the only posepack worth downloading from her site. Huh I wonder if I've ever seen others by her, if the pose player is safe after the holiday patch...which I feel like it might be but you never know, maybe I'll look for more heh. I think I was already linked to the updated version for now I'm just wondering about the holiday patch unless modders got an heads up and it's fine already hmm. @RedDestiny92 both teleporter and pose player have been updated and work just fine.